Unique Bed and Breakfast accommodation in the heart of historic Tulbagh. So much more than just a hotel, Cape Dutch Quarters is a local landmark with a distinct focus on relaxed country life, welcome service and genuine Tulbagh hospitality. A beautiful, romantic, convenient and friendly place to stay in Tulbagh. Your choice Bed & Breakfast Accommodation in Tulbagh’s historic Church Street. Get it all! Two nights B&B accommodation, a three-course dinner for two at a nearby restaurant and free tickets to visit the four museums of Tulbagh. Conditions apply. Prices based on two people sharing. Valid until the 14th May 2018. Deals not valid on the night before public holidays. The original T – shape house was built in 1810 by Petrus Francois Theron and extended into its current H – shape in 1861. After the earthquake, this house was destined for demolition, however Boland Bank (who owned the building at the time), elected to pay for the bulk of its restoration, the cost of which exceeded that of any other in the street. Our company mascots Fairfax and Horatio are well behaved Maltese cross dogs that spend most of their time sleeping on their throans in reception. Tulbagh Country Guest House was established in 2000 by Ginny Clark, the current owner’s late mother. 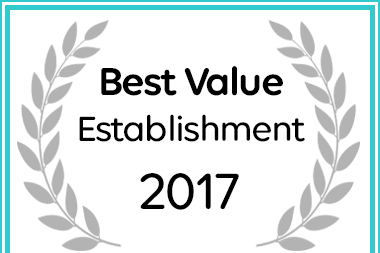 Cape Dutch Quarters has been named a Best Value Tulbagh Establishment.